The Auto Lift AL-430 Tri-Powered Inside Lift - The all-new AL 430 Tri-powered inside lift is a tri-motor, 400 capacity inside lift that combines power lifting and rotation with a 12" telescoping boom. This additional reach and compact design make the AL 430 a perfect solution for smaller rear door openings and side door mini van applications. For ease of use, the AL 430 utilizes Harmars exclusive " in and out" design, requiring just two simple steps to operate the lifts three motors. Operation is easy. The lift mounts into the drivers side or passenger side of a van, SUV or truck bed and is wired directly to the vehicle battery. The strap hooks onto the docking device on your mobility equipment, then push a button and the mobility equipment is lifted into the air, telescopes inward and electrically swings into the back of your vehicle lowers the mobility equipment to the floor of your vehicle. 400 Lb. weight lifting capacity for mid-sized to larger heavy weight electric scooters and wheelchairs. Triple motors provide full power lift, telescoping and rotation, making the loading virtually effortless. Adjustable boom height, from 30" to 40". Adjustable boom length from 12"" to 36". Harmar's universal AL 430 lift design makes this a highly adjustable lift that can be installed in either driver or passenger side of a vehicle and arrives fully assembled. 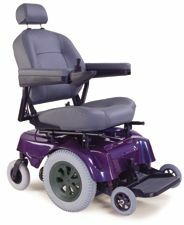 Standard features include an integrated offset post, stylish covers on both the base and boom and remote hand control.